For the past few months participants in Erika Jo Brown’s Spring 2017 Inprint Writers Workshop in Poetry–aspiring writers of varied backgrounds from throughout the greater Houston area–-have been exploring this form through in-class writing exercises, outside readings, and revising. Participants will give readings from the poems written in the workshops followed by an audience Q&A. 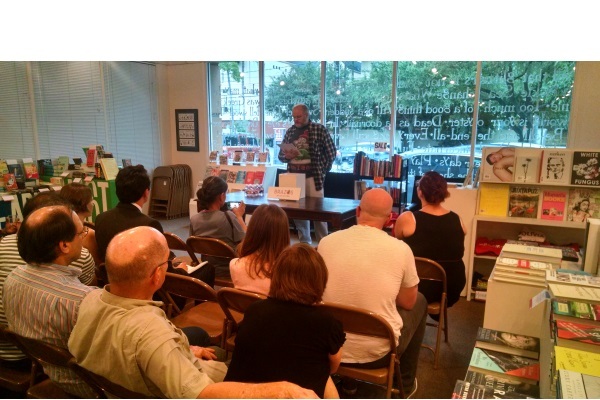 Special thanks to Brazos Bookstore for hosting this reading. This reading is preceded by other activities celebrating Independent Bookstore Day. Click here and here for more information. ERIKA JO BROWN is the author of the poetry collection I’m Your Huckleberry (Brooklyn Arts Press) and the chapbook What a Lark! (Further Adventures Press). She’s a graduate of Cornell University and the Iowa Writers’ Workshop. She helps co-organize the Poison Pen Reading Series and works at MD Anderson Children’s Cancer Hospital and the Menil Museum through WITS. Brown is a PhD candidate in poetry at the UH Creative Writing Program, where she teaches undergraduate creative writing, serves as the graduate advisor for Glass Mountain, and works as a poetry editor and reading series curator for Gulf Coast. She is the recipient of an Inprint C. Glenn Cambor/MD Anderson Foundation Fellowship.